Today, September 14th, demonstrators against the Apartheid Wall in the village of Al Walaja were met with severe repression by Israeli Occupation Forces (IOF). 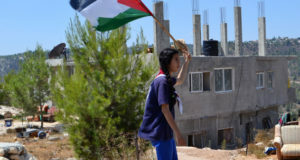 Walaja, which is located 8 kilometers west of Bethlehem, has taken up nonviolent resistance in protest of the building of the Apartheid Wall, which, when completed, will completely encircle the village. This will sever many villagers from their livelihoods in nearby Jerusalem, resulting in increased rates of unemployment. In Walaja 65 houses and the village mosque are slated for demolition under Israel’s policy of using state-sponsored terror to force indigenous Palestinians to emigrate. The future of the village appears bleak. In today’s demonstration, around 100 Palestinians, Israeli, and international activists gathered for a march to the Apartheid Wall. After the men of the village finished their prayer, the people marching climbed a hill in an attempt to reach the wall, but they were prevented from doing so by a line of IOF soldiers and military jeeps. While soldiers attempted to push the demonstrators back, the activists linked arms and held their ground. The activists then gathered around a military jeep and began chanting slogans against the illegal occupation of their land. 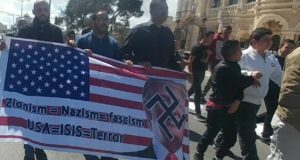 After about thirty minutes of non-violent demonstrating, the IOF set off a sound bomb in the middle of the demonstration, and soldiers began striking at the crowd with their wooden clubs. Several demonstrators, attempting to retreat, slid on the rocks and fell, and at least one Palestinian man was seen receiving hits repeatedly with a club while he was on the ground. A British activist was beaten several times with a club on his legs, hand, and chest. Soldiers also kicked demonstrators repeatedly. While this was taking place, several soldiers went around the crowd, attempting to arrest at least two Palestinians, seemingly at random. These attempted kidnappings were prevented with the help of other activists. By this time most of the demonstrators had retreated down the hill, and many were returning to the village. 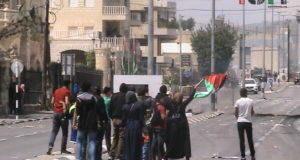 After the violent provocation from the soldiers, some Palestinian youth began to throw a few stones. Before the handful of youth could be dealt with by the much larger non-violent contingent, tear gas canisters were thrown at the activists, effectively dispersing those that remained. Several villagers from Walaja raised fears that the IOF would pursue the demonstrators into the village, and to prevent this stones and a garbage container were placed in the street as barriers. Fortunately, the military did not invade the village. The demonstration ended with villagers returning to their homes and Israeli and international supporters leaving for other cities. For some Israeli activists however, it did not end there. One group had parked their car within the line of fire of the IOF and returned to find their windows smashed in an apparent case of army-sponsored vandalism.